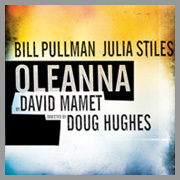 Following a critically-acclaimed run in Los Angeles, David Mamet's Pulitzer Prize-winning drama Oleanna made its Broadway premiere in the Fall of 2010 in a production starring Bill Pullman and Julia Stiles and directed by Tony Award winner Doug Hughes. USA Today called it “A gripping new production! Oleanna has lost none of its power and is bound to inspire animated conversations long after the curtain falls. Julia Stiles is riveting. You'll swear you can see Bill Pullman's blood pressure rising, and you may feel your own going up as well.” Variety called the production “One of the spellbinding emotional exhibitions of this theatrical year!” and the Associated Press called Oleanna “Intense and inflammatory! Bruising and fascinating!” The production concluded its limited run on Broadway on December 6, 2009.